2017 marks the 60th anniversary of the wave of 1957. This is an extensive report on an on-going project involving a number of people. I would not have been able to do this without the help of Rebecca Wise (Project Blue Book Archive), Dan Wilson (archive case researcher), Jean Waskiewicz (NICAP Database), Brad Sparks (Comprehensive Catalog of Project Blue Book Unknowns), Barry Greenwood (newspaper clippings), Mark Rodegher ("UFO Reports Involving Vehicle Interference" [441 Cases], Loren Gross (UFOS A History), and Joan Woodward (Animal Reaction Database). 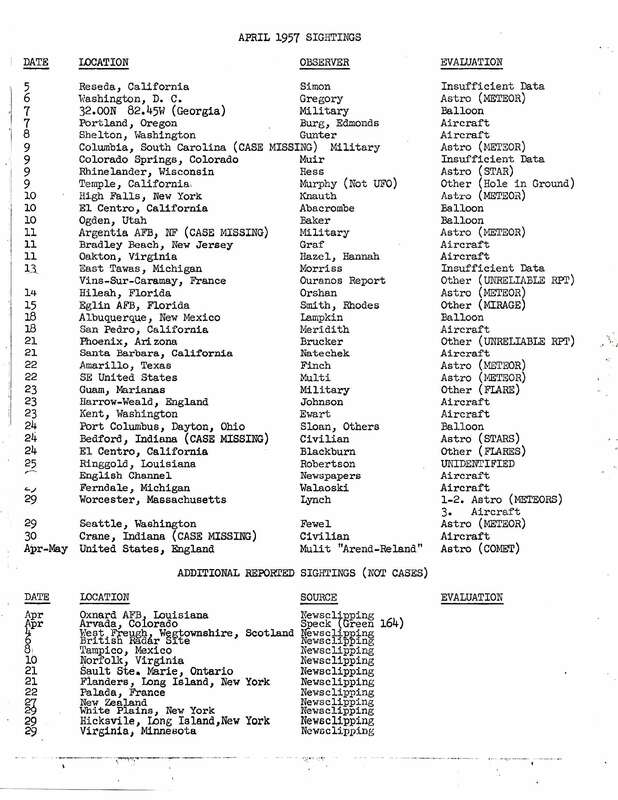 A major sighting wave year, 1957 is best-known for the Levelland, Texas sightings which began on Nov. 2. 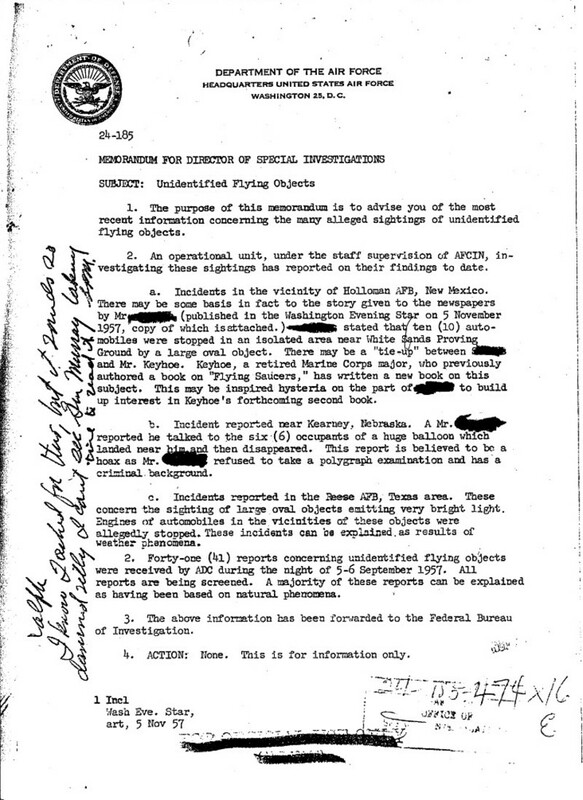 However, the key cases are the IFF electronic signaling and radar-emitting UFO cases such as RB-47 (July 17) and several others within a week or two before and after, the radioactivity case at Montville, Ohio (Nov. 6) and the nuclear weapons storage area case at Kirtland AFB, New Mexico (Nov 4), all cases of supreme scientific value. Prior to the wave flap, the Sept 20, 1957 radar tracking caused a White House and top intelligence alert. A very important year in UFOlogical history. Throughout this summary are posted key reports from the highly-acclaimed publication, "UFOs & Government". First thought to have been taken in March of 1954, it is now certain that the clean, sharp, detailed version we have become accustomed to from the RAF Flying Review for the Rouen photo, is a doctored version of the Trent image. The question now becomes, who doctored it up and why? Retired Rear Adm. Delmer S. Fahrney, once head of the Navy's guided missile program, said that reliable reports indicate that "there are objects coming into our atmosphere at very high speeds." He told a news conference that "no agency in this country or Russia is able to duplicate at this time the speeds and accelerations which radar and observers indicate these flying objects are able to achieve." Fahrney called the news conference following an organizational meeting of a new private group. the National Investigations Committee on Aerial Phenomena, of which he is board chairman. On this night an airline pilot flying over Indy and many others saw four brilliant nocturnal lights trailing a large pulsating ovoid object. 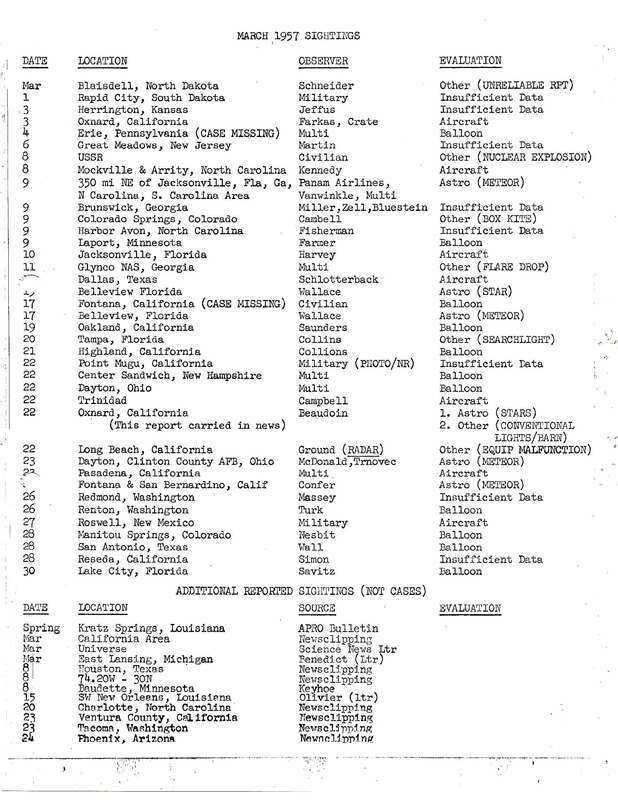 (Sources: Richard H. Hall, The UFO Evidence, p. 136; Dominique Weinstein,Aircraft UFO Encounters, p. 28). 2:30 a.m. USAF Director of Operations and 3 tower controllers at 2 radar sites, the GCA and NCOIC, tracked several targets flying behind an airliner at a distance of 5-6 miles traveling 2x as fast. No IFF response. Objects could hover and move at high speed, one split into 2 objects, another did 180° turn. Blips the size of a B­47. (Hynek UFO Exp chg. 7, case RV-7) 3-5 mins [25 min]? 4:40 a.m. MST. Two objects the size of a pea with red, yellow, and green blinking lights were observed at high altitude. Two objects were picked up on AN/FPS-3 radar at 310 degrees, at 25NM, at 24,300 and 26,500 feet altitude One of the UFOB remained stationary and the second orbited the first. One of the objects escorted an interceptor plane for 25 NM on interceptor recovery prior to breaking off. The total length of observation was 2 hours. Maj. Byrne and Mr. Sanderson, held in 4E Conference Room 1410 -1500. Subject: UFO Societies and self-styled. "UFO Experts". Example; Mr. Stringfield, UFO Director, constant barrage of criticism, nuisance to UFO unit, etc. Pan American Airways pilot took evasive action as fiery round, greenish-white object passed plane. [NICAP UFOE, V] Pan Am 215-A incident. .
At 2235 hours, a cigar-shaped, golden in color, glowing object was observed at approximately 60 degrees above the horizon to the west of Reseda, California. The object had an elliptical glow surrounding the cigar-shaped core which was approximately five time brighter than the outer light. The object was observed for approximately 3 to 5 minutes. Letter signed by Donald Keyhoe confirms Admiral Delmer Fahrney had to resign from position of NICAP's Chairman of the Board because of his wife's illness and heavy business pressures. Fahrney: "I will continue on (as an) interested member of the organization." "Television started to have all sorts of trouble"; witness called out-doors in time to see red disc pass overhead. May 2, 1957; Edwards AFB, Cal. June ? ?, 1957; Baltic coast and the Mazurian Lakes District of Poland. 8:30 [9:35?] -9:30? p.m. (CST). Shortly after takeoff from Shreveport Airport, heading for Lake Charles, La., and climbing, Capt. Lynn Kern and FO Abbey Zimmerman flying Trans-Texas Airlines Flight 103 were told by the control tower that a small light was visible nearby. They saw the star-like blue-green pulsating [?] object hovering (approaching?) at their 10 [2?] o'clock position at about 400 ft then climbing rapidly to 1,000 ft paralleling the airliner then at 110 knots speed (130 mph later 165 mph) but at higher altitude and 1/2 mile away. Kern flashed landing lights and object responded with a beam [?] of light. 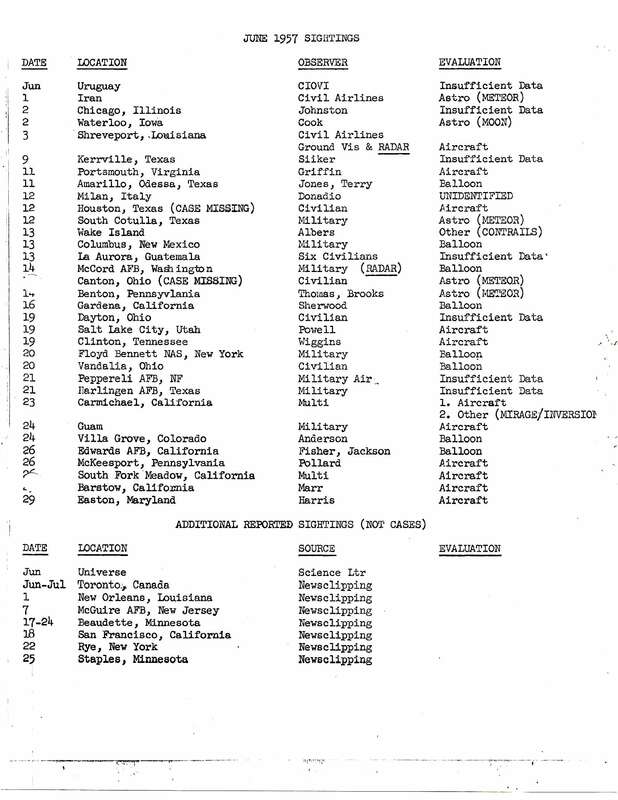 2nd blue-green pulsating object joined the first on the opposite side of the airliner (then at 9,000 ft), air crew confirmed from tower that it had both objects on radar and visually through binoculars, objects headed S at 170° climbing to about 10,000 ft and followed airliner to Converse, La., (about 45 miles S of Shreveport) where pilot queried ADC radar site, England AFS, Alexandria, La., which confirmed the 2 targets in the airliner's vicinity at 9,700 ft. Objects disappeared from sight in a cloud deck to the SW. (Hynek UFO Exp ch. 7, case RV-6; NARCAP) 1 hr ? July 1, 1957; Avon, Mass. A woman first spotted a large and very fast object, moving high in the sky and on a straight path. She pointed it out to her husband and the rest of their family. They watched it for about thirty seconds until it disappeared. Compared to most cases, this was not much. But the husband thought that it was an unknown, and he was Nathan Wagner, the chief of Missile Flight Safety of White Sands Proving Grounds (and, today, a member of the WSPG Hall of Fame). Wagner, who knew about many safety-related airliner incidents and, apparently, many UFO incidents as well, stated to the newspapers that he felt that these unknowns could have something to do with the near-miss airline incidents recently reported.47 (UFOs & Government, 249; Blue Book microfilm Roll 28; UFO Investigator 1 (2); Aug-Sept 1957(quoting the El Paso Times). 11:31 p.m. EST (0431Z). Capital Airline pilots of Flight 841 observed a large round yellowish-white object at approximately 20,000 feet altitude. The object came from the north and passed in front of the aircraft. It appeared brilliant, then went to dim and back to brilliant. The object hovered over Cleveland and then moved northwest. During this incident the airliner chased the object but it sped ahead of them and over the horizon. The object was extremely fast and was in sight for 8 minutes. Both pilots sure object was not a star. (Dan Wilson, BB files). Walking along the edge of a field, a young man and his dog encountered a domed object and saw it land in a gully. The witness was frightened and his dog was described as snarling and barking. [The reaction of the dog sounds defensively fearful—jw] The object was reported to make a humming sound like a ball being swung on an elastic band. Midnight. Two policemen patrolling the seafront saw a blood-red object with a jagged black streak across its centre rise out of the water on the horizon. Chief-Inspector Reginald Jones, of "D" Division, Glamorgan Police, told Flying Saucer Review that the two policemen thought at first that they were seeing a ship on fire on the horizon towards Ilfracombe. But then it rose out of the water like a blood-red sun, a good deal larger than a full-sized harvest moon. While the two police officers watched, two more streaks appeared above and below. It remained at sea level, then suddenly took off at a fantastic speed towards the Atlantic. Chief-Inspector Jones said the report had gone to top level. An Air Ministry spokesman said that one possible explanation of the phenomenon was that it was "a planet playing tricks." "Venus does at certain times of the year play all kinds of tricks--often due to climatic conditions.'' Flying Saucer Review has since ascertained that Venus went below the horizon one hour after sunset on that evening. Sunset was at 7.48 p.m. (Summer time). So it could not possibly have been visible at around midnight! (Rullan; Flying Saucer Review, Vol. 3, No. 6, p. 9, November/December 1957, “UFOs Ahoy!” by Janet Gregory). 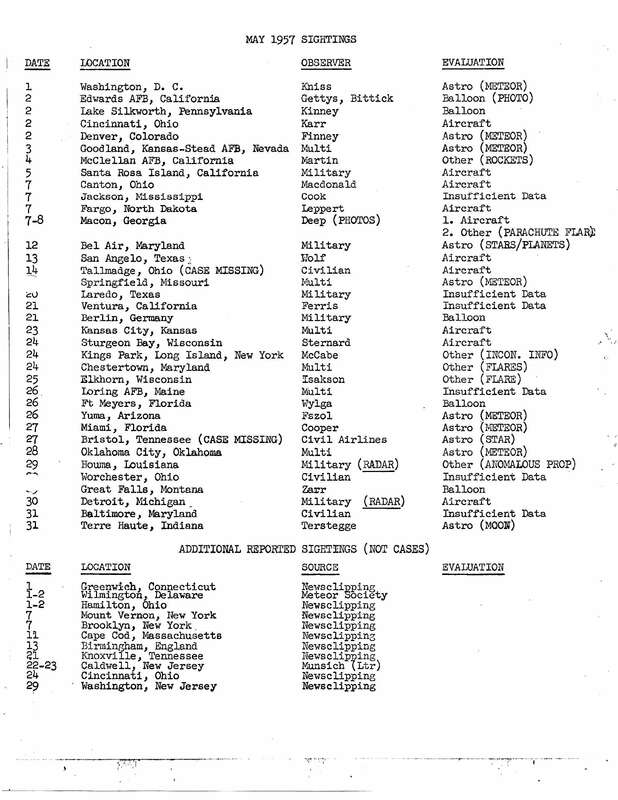 ADC received 41 reports of UFOS on one night, September 5-6, 1957. Yet there are only 3 cases listed in PBB Master Index for September 5. Where are the 41 reports? Sept. 17, 1957; Ft. Devens, Mass. 8 p.m. S/Sgt. H. T. O'Connor and S/Sgt. H. D. Bridgeman saw an object, shaped like a coke bottle without the neck, translucent and fluorescent, make four 5-10 second passes from N to S, with 4-5 mins between passes. (Berliner) 4 x 5-10 secs ? 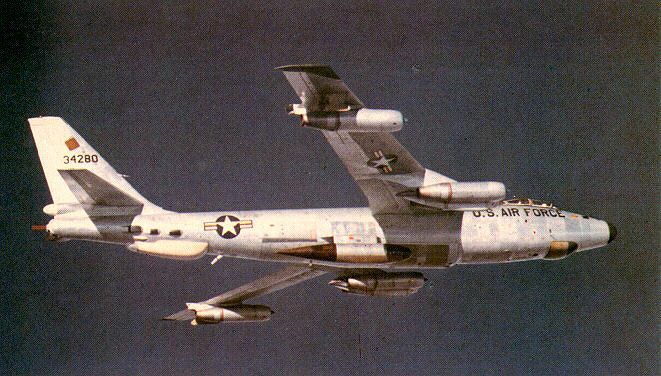 USAF Strategic Air Command began Ground Alert Operations on October 1, 1957, whereby it would maintain approximately one-third of its aircraft on ground alert, with weapons loaded and crews standing by for immediate take-off. Soviet Union launches the world's first satellite, Sputnik 1, at 2:28:34 p.m. (EST). Oct. 7, 1957; Cape Canaveral, Fla.
Natives in small boat saw UFO descend vertically, hover about 20 feet above sea. Oct. 8, 1957; Nr. Boston, Mass. OSI sent information on this report to the Commander AF Cambridge Research Center, L.G. Hanscom Field, Bedford, Mass]. Oct. 22, 1957; Pittsburgh, Pa. In the first week in November 1957, the predicted UFO wave exploded onto the scene. As sightings occurred worldwide, the greatest number of sightings seemed to concentrate in the United States, Brazil, and Japan. In terms of numbers the UFO wave of 1957 produced more UFO sightings than any other UFO wave. 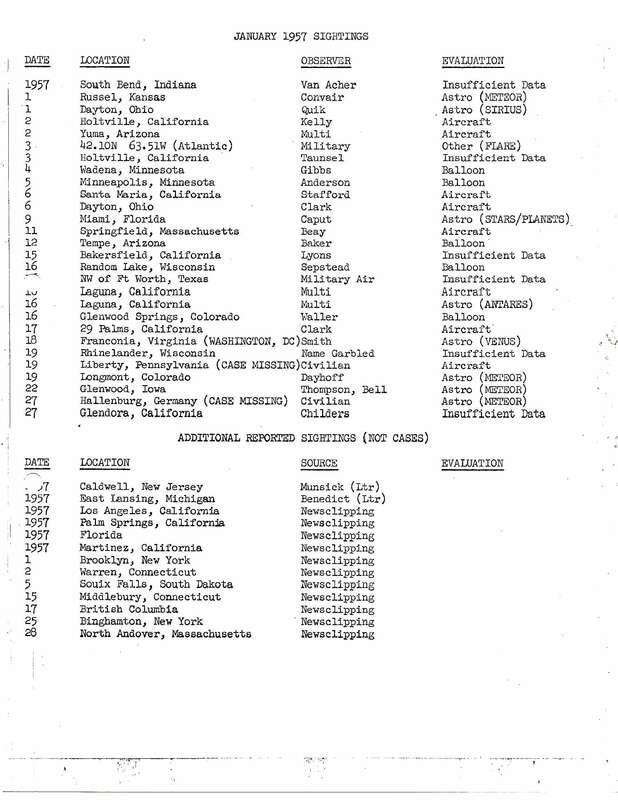 At this unique period of time the CIA established "The Director of Central Intelligence Committee on Overhead Reconnaissance". Years later this committee evolved into the very spooky National Reconnaissance Office. The NRO's focus was planet Earth. Soviet Union launches the second earth satellite, Sputnik 2, at 9:30:42 p.m. (EST), this time with a dog on board. Among the witnesses during the evening was Sheriff Weir Clem, who was searching the roads as a result of earlier reports and saw a reddish oval cross the road, illuminating the pavement. 12:45 a.m. In one probably significant report Ronald Martin was on Rt. 116, about 5 mi W. of Levelland when he saw the glowing red UFO land ahead of his truck, then turn to bluish- green. The truck's electrical system failed. When the UFO took off, it turned reddish again. In the early hours of the morning, two sentries at the heavily defended Brazilian fort of Itaipu near Santos noticed a bright orange light over the sea. To their amazement it became larger and larger and was obviously approaching the fort. The sentries' suprise turned to fear as the object loomed steadily larger in the darkness. It became obvious to them that this was no ordinary phenomenon. The object held its course until it was directly over the sentries, and was visible as a gigantic round body which flooded the ground and three guns with a mysterious red light. The sentries gazed up at the threatening monster with open mouths, its diameter was at least as large as the wingspan of a DC-3 and scarcely a hundred meters away. Suddenly there was a strange buzzing noise, and the men felt a wave of glowing heat. (Click on directory link above). Brilliant round orange object hovered, revolving; television blacked out. Nov. 5, 1957; Haverhill, Mass. Apartment lights dead, electric clock stopped; bright light awakened couple. Milkman reported flaming disc. Nov. 6, 1957; Nr. Atlanta, Ga.
1:20 am. Mrs. Leita Kuhn had been going back and forth between her house and backyard dog kennels checking on an overheating stove on a snowy, windy night. Everything was in order, so she shut the kennel door. The snow had stopped and it was dark, with no moon or stars visible. As she stepped away from the kennel she saw a huge glowing object in back, about 60 feet above the ground. It was about 40 feet wide and 10 feet thick with a dome on top, and glowing with a phosphorescent light. The top was brilliant and it hurt her eyes to look at it. Puffs of apparent exhaust appeared around the bottom increasingly, until she became unnerved by the spectacle and ran in the house. When she looked out the window, the object apparently had disappeared. The time was 1:55 a.m. A few days later she sought medical treatment for eye irritation and skin rash, and was advised to report it to Civil Defense because of suspected radiation effects. She developed an abnormal craving for honey, other sweets, and water. For nearly two years she experienced a variety of physical ailments, some painful and emotionally disturbing. (Strange Effects From UFOs, [NICAP, 1969], page 11). TV disrupted as UFO seen. 12:01 p.m. local time. (601st AC&W Squadron) The first target was initially detected on AN/MPS-11 and AN/MPS-14 (?) radar at 22 miles SW of Merseberg Sovzone Airfield, at 100 degrees azimuth at 70 nautical miles. This radar blip split into two targets on a parallel course on separation. The flight path was to the north. The speed of the targets were from 2,000 to 3,000 nmph. At 6:42 p.m. (1742Z), a high speed target was detected on the AN/MPS-11 radar at 100 degrees at 135 nautical miles with a flight path to the north. The height indicator showed the target at 60,000 feet, changing to 63,000 feet. This sighting lasted for 2 minutes. There was an unusual amount of electronic interference which the radar maintenance officer was able to explain except for the target being reported. Nov. 15, 1957; Carthage, Tenn.
9:00 p.m. Eight people traveling together in two cars saw a "huge, fiery object" pass overhead from north to south. The two cars stalled out and their headlights also failed as the UFO came overhead. In addition, the inside dome lights came on, even though they weren't turned on. The cars remained stalled until the object had passed out of sight. 1715Z to 1730Z LTJG with the Fleet Intelligence Center, Eastern Atlantic and Mediterranean, his wife and daughter (age 11). observed while traveling by automobile, a bright yellow to orange-like about the size of the moon to the SW for about 15 minutes. After a while the light descended towards the earth and for about 30 seconds it was blocked from view by some trees. When seen again the light was at its former altitude in a horizontal position. The car was stopped and the bearing of the light did not appear to change. The light became dimmer and faded from view. 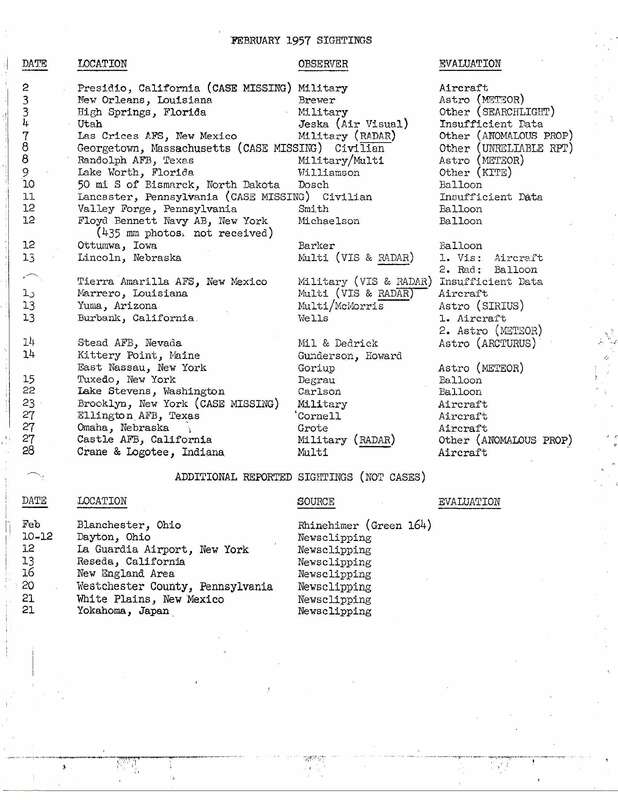 (Loren Gross: This Navy intelligence report form was forwarded in 9 copies to the CIA and only one copy to USAF Director of Intelligence) In case someone tries to argue that it was the moon, which was full (97% illuminated), it would not rise for another hour and a half, at about 1845Z, and it was in the opposite direction from the UFO in the SW. The moon was in the NE or ENE at azimuth 67 degs and would have ascended higher and higher into the sky and not disappear until the next day, not 15 mins later. (Brad Sparks). Dec. 16, 1957; Old Saybrook, Conn.